Uh-oh. We contravened something. We must have been missing meat. While we knew that purer vegetarians and vegans than us were more than happy to eschew fake meats completely and embrace only legumes and other healthier, unprocessed forms of plant protein, it hadn’t occurred to us that fake meat was frowned on by some of the blue-skinned crowd. We felt dirty. And guilty! That was then, this is now. We don’t care anymore. We boldly place ‘Yves Deli Slices’ on the conveyor next to organic whole wheat couscous. Our sulpher-dioxide-free apricots nestle up against Lick’s delicious veggie Garden Burgers, glorious in their real beef burger consistency. I buy Kraft Dinner but frown on others who buy quinoa because it’s become so posh that poor South American folk can no longer afford the staple grain that has kept them alive since the beginning of time. If I get a whiff of barbequed steak my feet barely touch the ground, but I’m walking with a bag of organic bean sprouts and dried chick peas. We’ve come to terms with this and no longer purchase our ‘meat analogs’ furtively at the self-checkout at Bloblaws. I dare you to frown on my choices Lululemon-wearing, Mercedes-SUV-driving soccer-moms. I’ll challenge you to a bean stew-making contest any day. I WILL win. Anyone remember that song? It went something like this: Shirley-shirley bo burley, banana fanna fo firley, fee fi mo mirley, Shirley! Well, whenever I hear the word Tofurky I think of that song that I’m far too young to remember. I think Turkey turkey fo-furkey banana fanna To-furky, fee, fi…well you get the picture. 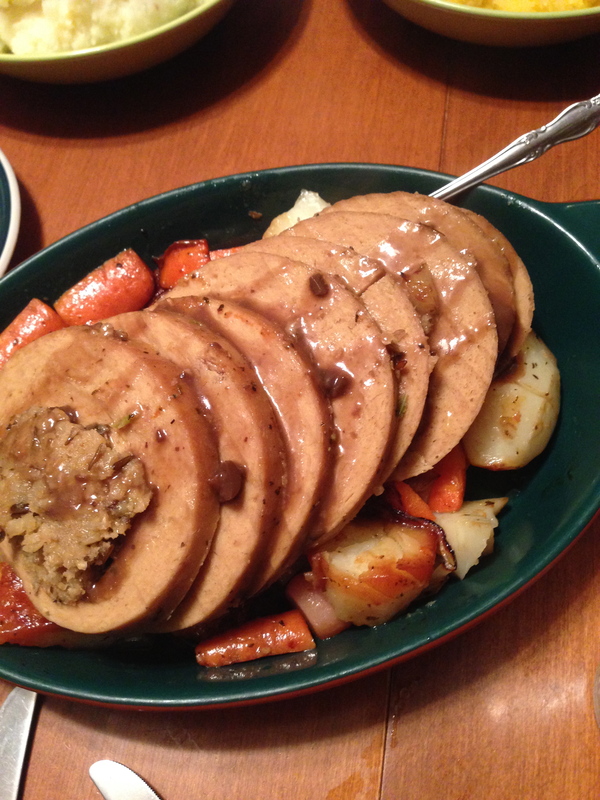 It’s called a Tofurky Roast, and while it tastes similar to turkey, it doesn’t look anything like one. We have fond memories a vegan fish in a hotpot and a vegan chicken in another, in a little kitchen-sized restaurant off a hutong in Beijing. The Chinese government pays for a traditional Peking Duck dinner in Beijing for adoptive parents and our guide Lily went out of her way to find us an alternative. The place was so off-the-beaten path that it didn’t even have a sign out front. We ate fake chicken that looked just like chicken, and fish looked that looked so remarkably close to the real thing it even had scales on it made from seaweed. Probably one of the best meals I’ve ever eaten. So the first time I had a Tofurky roast I loved it. It’s shaped into a ball and not formed into the shape of a turkey (then it hit me that turkeys are now bred to become just giant balls of protein but that irony is too complicated for me to address at this late hour). For those meals we just enjoyed what we were eating. Added some mushroom gravy, mashed potatoes, rutabaga, roasted veggies, a can-shaped tube of ‘cranberry’ sauce and it was a traditional Thanksgiving or Christmas holiday dinner. This entry was posted in Ramblings and tagged chinese hotpot, guilty vegetarian, meat analogs, tofurky, veggie, zogo's by budbug. Bookmark the permalink.